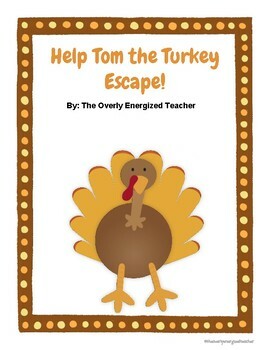 Help Tom the Turkey Escape! It’s getting close to Thanksgiving and Tom the Turkey is getting nervous! He does not want to end up on Farmer Brown’s dinner table! Will you help him escape the farm in time? Students will be able to draw step by step directions for helping Tom the Turkey escape. They will then write their step by step directions. Once they have Tom the Turkey off the farm, they will need to disguise him. 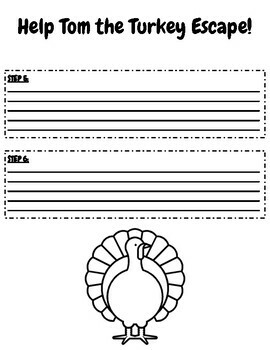 There is a copy of a blank turkey for the students to disguise. 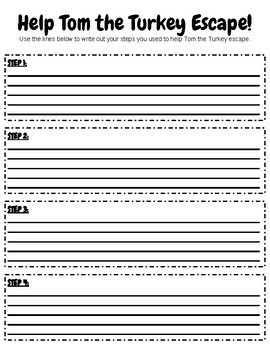 The final piece is a writing prompt activity. Now that Tom the Turkey has escaped Farmer Brown's farm, what will he do for Thanksgiving? Will he lounge on the beach? Will he visit New York City? The decision is up the students. They will write about where Tom has headed.